Aligned Collective’s mission is to support local economic growth through connected spaces where people, projects, and place intersect and can connect to larger networks. Local people hosting their own events is one way we do this. With roughly 3,000 square foot of downtown space and ample parking, Aligned Collective is a great event space for your next community event: group trainings, thought leadership panels, or corporate shin digs. In addition, Aligned Collective loves to partner, collaborate and/or support people, businesses and organizations in the community who would like to host an event, meeting or workshop. Aligned Collective can support by offering production-based services and creative approaches to bring added-value to your event. What was it? A conversation between 9 panel members on the future of Squamish economy through the perspective of Rec Tech: Including discussions from Gary McFarlane, trail and climbing infrastructure, including Rupert, Somewhere Over There, and Single Trackmind, Melissa Sheridan, Race Director Hot on Your Heels, SORCA, Steve Tulk, Kite Clash, Squamish Windsports Society, Mark Bunyan, Coach, Mountain Bike Camp director, Matt Fraser, Airhouse, Tanya Skok Hobbs, Mountain Biker, Owner: Shala Yoga (unfortunately couldn’t make it), Kirby Brown, General Manager: Sea to Sky Gondola, Toby Foord-Kelcey, Climber, Squamish Access Society, and Kevin McLane, Climber & Author, Guide Book Publisher. What was it? A panel discussion led by 5 people, 5 lives and 5 stories with the tagline: “Professional and personal perspectives on life as a man, for them and the people that love them.” Featuring Greg McDonnell M. Ed, RCC, SEP, Sarah Jeffrey MA, CCC, NLP, Danielle Berman, Ride Away Stigma MSW, RSW, RCC, Zac McHugh Helping Hands Squamish, and Alexander Moir, Sky to Soul Services. What was it? 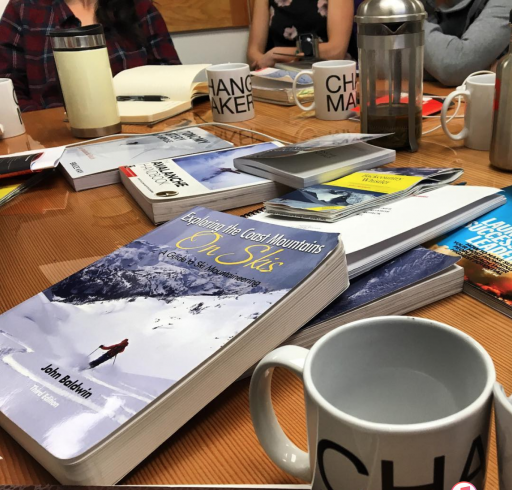 Avalanche safety training starts with classroom knowledge and learning, the Aligned Collective boardroom was the perfect space to kick off and psyche up an all-women AST course last December. The group met around the big, live edge conference table to discuss how to travel confidently and safely in the backcountry and used the huge monitor to follow along with snow science education, forecasting, as well as learning how to use modern technology to better prepare for the backcountry. The few events we featured above are a representation of the activity that happens at Aligned Collective’s coworking space. A short list. Many other occurred including a forum on marine biology, public speaking, cannabis, a conversation on urban responsibility, a meeting on commercial real estate development, First Aid training, a kid’s science camp, social work hours, and more. Looking to the year ahead, for us the more events, the more diverse the topics, the more people we can help empower to access knowledge and education in our community—the better! We’re proud to continue our commitment to bringing in top speakers, new thinking, and innovative presenters to Aligned Collective, and look forward to hosting your next event too. When you’re looking for things to do in Squamish, we hope you keep our event in mind. Please inquire about how to host your event at Aligned Collective and/or partnership with us to curate an event, workshop or dialogue. We’ll do everything we can to help animate your ideas.